Air Con & Cooling. Air Conditioning Cooling Parts. Air Conditioning Control Valve. Cooling Fan & Motors. Evaporators & Expansion Valves. Receiver Drier & Parts. Fan Drive Belt Guides & Pulley. Fan Drive Belt Tensioners. Fan Drive Belts & Kits. Guide Pulley Timing Belts. Timing Belt Guide & Pulley. Timing Belt Kit Inc Water Pump. Timing Belts & Kits. Timing Chains & Parts. Vibration Damper Timing Belts. ABS Control Unit Sets. ABS Pump & Sensor Rings. ABS Traction Control Sensors. Brake Pad Fitting Kits. Brake Pad Set – Parking Brake. Brake Shoe Kits & Fittings. Brake Caliper Accessory Kits. Brake Master Cylinder Parts. Calipers & Caliper Parts. Fluid Reservoir & Cap. Vacuum Pumps & Gaskets. Seat Back Adjustment Cable. Clutch & Flywheel Parts. Guide Tubes & Quadrant Kits. Combined Master & Slave Cyl. Concentric Slave Cylinders CSC. Master / Slave Cylinder Kits. DMF’s & Clutch Package Kits. Solid Flywheel Conversion Kits. Dual Mass Flywheels (DMF). Indicators & Side Repeaters. Day Time Running Lights. Bumpers & Bumper Fittings. Wing Mirrors, Covers & Glass. Cooling Fan & Motor. Expansion Tank & Parts. Fan Coupling & Viscous Blades. Other Cooling & Heating Parts. Radiator / Expansion Tank Cap. Radiator Fan Castor Relay. Thermostats & Housing Gasket. Timing Belt Inc Water Pump. Water Pumps & Gaskets. Oil Pressure Switches Senders. Wiper Linkages & Motors. Crank Pulleys & Bolts. Crankcases Breather & Parts. Crankshaft Gears & Gasket Sets. Engine Bearings & Bushes. Engine Block Breather Valves. Exhaust Valve & Inlet Valves. Head Gaskets & Sets. Inlet Manifolds & Gaskets. Oil Dipsticks & Funnels. Oil Tanks & Parts. Rocker Arms & Parts. Rocker Covers & Gaskets. Sump Gaskets, Plugs & Seals. Timing Case Cover Gaskets. Diesel Particulate Filters DPF. Fuel & Engine Management. Air Mass Sensor MAF. Fuel & Engine Management Parts. ECU Superchips / Bluefins. Performance Clutch & Flywheels. Performance Coil Over Kits. Roof Bars & Roof Racks. Tyre Pressure Systems (TPMS). Wheel Locks, Spacers & Fixings. Cabin / Pollen Filters. Sump Plugs & Seals. Anti Roll Bar Bushes & Links. Ball Joints & Fitting Kits. Control Arms / Wishbone Bushes. Power Assisted Steering Pump. Rear Subframes & Bushes. Steering Columns & Parts. Steering Control Arms Bushes. Steering Racks & Parts. Suspension Arms & Bushes. Track Rod Assemblys & Ends. CV Boots & CV Joints. Transmission Filter Sump Seals. Gear Levers & Linkages. Air Tools & Compressors. Tyre Inflators / Compressors. VW New Beetle Skoda Seat Audi – SKF Timing Belt Kit Water Pump Engine Cambelt. Kit Contains Water Pump. Extra Information: Timing belt kit with water pump and damper. Other Information: Kit Contains Water Pump. PLEASE NOTE: The vehicle compatibility should be used as a guide only, on occasions there might be more than 1 option available for some vehicles. Timing belt kits contain everything needed to replace the timing belt and its associated parts. It connects the crankshaft to the camshaft(s), which in turn controls the opening and closing of the engine’s valves. The kit generally includes the belt itself, idler and tensioner pulleys which are necessary to maintain or decrease slack as needed, and bolts needed to secure everything in place. When a timing belt is replaced, correct belt tension is critical. If the belt is too loose, it will whip, too tight and it will whine and put excess strain on the bearings of the cogs. In either case belt life will be drastically shortened. For this reason it is important to replace all the timing components, rather than just the timing belt. It’s vital that your engine operates at a proper working temperature. Car engines can get extremely hot and quickly suffer serious damage as a consequence. Usually located at the front or side of the car behind the fan belt, it’s the job of the water pump to squirt water from the radiator to the engine in order to regulate its temperature. Centrifugal force then forces water into the engine block on into the cylinder heads before draining back into the radiator ready to be recycled through the system. If coolant starts leaking or you notice your engine overheating then replace your water pump immediately, as engine damage may be irreparable. All deliveries will require a signature so please ensure someone is present to sign for the item. The couriers will try and deliver the item twice before returning the item to us. Channel Islands All GY & JE Postcodes. Isle Of Man All IM Postcodes. Scilly Islands Postcodes TR21-TR25. Scottish Highlands All HS, IV, KW, KA, PA, PH & ZE Postcodes. Aberdeenshire All AB Postcodes. Northern Ireland All BT Postcodes. Orders Delayed/Missing in Transit. We promise we’ll do everything we can to ensure you receive your order within the time-frame specified. Occasionally events beyond our control may result in your parcel being delayed whilst it is with the courier and we cannot be held responsible for such delays. All parcels are fully insured and if your parcel is lost or delayed, let us know and we’ll act quickly to locate it, bearing in mind the points below. All claims for missing items must be made within 28 days of the date of your order. Please note that we do not dispatch orders on weekends. We use Tuffnells and UPS. Tuffnells provide all radiators and exhaust part deliveries. All other items are dispatched with UPS. Full details of our terms and conditions can be found HERE. Based on the manufacturers’ opinion and further subject to clause 14.5 and 14.6 (see terms and conditions), we will repair, (or at our sole option) replace such Goods with the same or superior Goods, without charge or not provide any of the aforementioned. Before returning any goods please read our Terms and Conditions. Please return your item(s) in original packaging and ensure that all packages are securely wrapped. Upon receipt, all products will be inspected and at our discretion, credit may be refused. Any damages must be reported to us within 24 hours for us to raise any claims with our courier. Any claims after 24 hours will be dismissed for a claim. Certain products are treated specially for legal and/or health and safety reasons, It is important for your own and our couriers safety that they are followed. As well as the above procedures the below must also be adhered to. The item “VW New Beetle Skoda Seat Audi SKF Timing Belt Kit Water Pump Engine Cambelt” is in sale since Thursday, July 31, 2014. 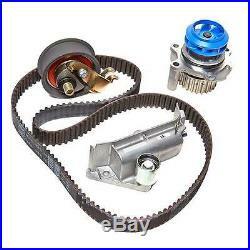 This item is in the category “Vehicle Parts & Accessories\Car Parts\Engines & Engine Parts\Belt, Pulley & Tensioner Kits”. The seller is “carpartssaver” and is located in London. This item can be shipped worldwide.